The ROTC program at St. Mary’s University has a variety of activities designed to enhance the experience of its cadets. 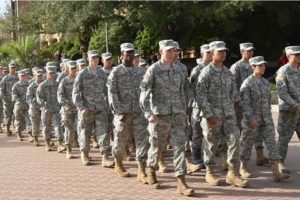 It is important to point out that ROTC is designed to enhance the university experience and students are encouraged to participate in University-wide extracurricular activities. The following is a partial list of activities offered by the St. Mary’s ROTC program. Color Guard: A select group of cadets representing St. Mary’s University ROTC Military Science Department participate in various campus and community ceremonies. This group has even participated in several San Antonio Spurs’ games. Intramural Sports: Cadets field athletic teams that compete against other University students in a wide variety of sports. Marian Guard: This is an outdoor-oriented unit for those students looking for extra military and physical training. They meet on campus once a week and hold a few one-day field training exercises using National Guard and Reserve facilities. Social Activities: Several social events are held throughout the school year including a Military Ball, cadet parties, and recreational actives. The ROTC program at St. Mary’s University remains an excellent way for students to enrich their university experience, earn money and scholarships, and as work towards an exciting and rewarding career. Airborne Training: The U.S. Army Airborne School, located at Fort Benning, Georgia, is available to cadets that are enrolled in the program. The course is three weeks long, consisting of a ground week and jump week. With each week comes different types of training designed to teach you how to parachute out of airplanes and helicopters. It is an exciting, nonstop course that will push you to the limit. Air Assault Training: Air Assault training is available at different Army posts across the country. It is a 10- to 12-day course consisting of physical training, sling load training, rappelling, and a 12-mile timed road march in full combat gear. This is a tough course that will exhaust you both physically and mentally, but in the long run it will be worth everything you put into it! Northern Warfare Training: Northern Warfare Training Center (NWTC) – Filling the need for special arctic warfare training is the United States Army’s NWTC. An exclusive school that provides training in arctic survival, navigation of land and waterways, military skiing, mountaineering and river crossing operations. The school trains not only active duty soldiers but soldiers from other services, reserve soldiers, ROTC, West Point cadets and allied military soldiers. Emphasis during the summer is placed on mountain warfare while the winter months are used to train soldiers on how to adapt to living in the field, clothing use and maintenance, as well as snowshoeing and military skiing. NWTC is also the home of the Army Mountaineering Team. Each year the team joins soldiers from allied countries to attempt a multinational friendship climb up Mount McKinley. Mountain Warfare Training: Mountain Warfare School is a two-week course conducted at the Ethan Allen Firing Range at Jericho, Vt. Both a summer and a winter phase are offered. Its mission is to develop and conduct resident mountain warfare training under both summer and winter conditions. The mountain warfare course develops the leadership and technical skills of Army personnel by requiring them to perform mountaineering tasks in a realistic tactical mountain environment. It provides the student with the practical hands-on experience in the application of tactics and techniques needed for mountain operations. Cadet Troop Leader Training (CTLT): CTLT increases each cadet’s leadership experience. Each cadet is assigned to a platoon leader position and given an opportunity to lead soldiers. It familiarizes cadets with the command, training, administration and logistical functions of active duty units. It also exposes cadets to the on-duty and off-duty environment of the junior officer.